The most imposing of all the churches at Old Goa, its vaulted interior overwhelms visitors with its sheer grandeur. 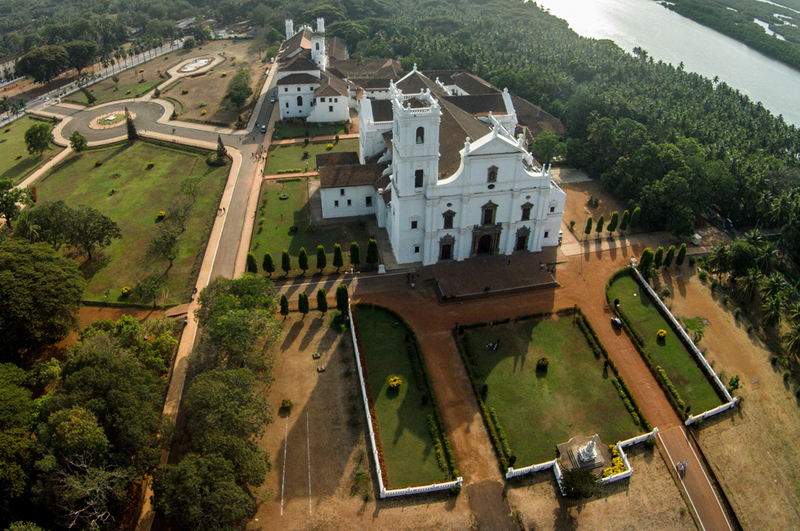 This Cathedral has five bells, among them the famous Golden bell, the biggest in Goa and one of the best in the world. The church is dedicated to St.Catherine of Alexandria. One of the most ancient and celebrated religious buildings of Goa, this magnificent 16th century monument to the Roman Catholic rule in Goa under the Portuguese is the largest church in Asia. 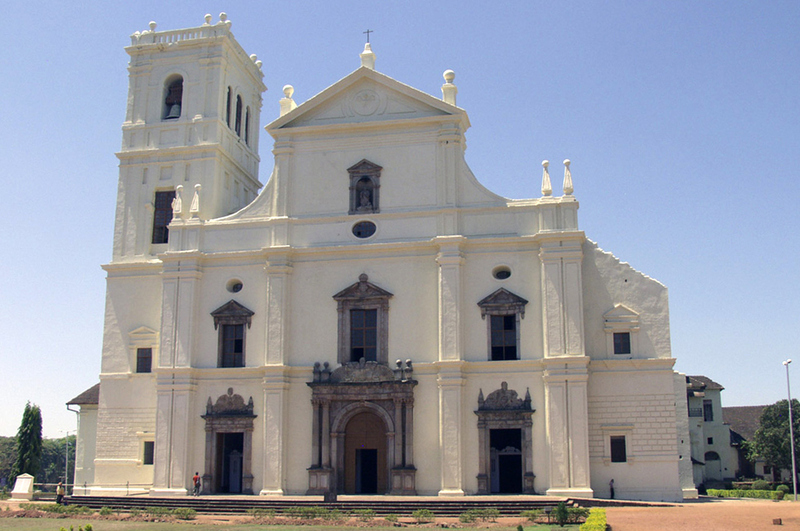 The Cathedral is dedicated to St. Catherine of Alexandria on whose feast day in 1510 Alfonso Albuquerque defeated the Muslim army and took possession of the city of Goa. Hence it is also known as St. Catherine’s’ Cathedral. The Cathedral was commissioned by the Portuguese Viceroy, Redondo to be “a grandiose church worthy of the wealth, power and fame of the Portuguese who dominated the seas from the Atlantic to the Pacific”. The final edifice is bigger than any of the churches in Portugal itself. The construction of this imposing edifice began in 1562 during the reign of King Dom Sebastião (1557-78) and substantially completed by 1619. The main altars however were not finished until the year 1652. It was consecrated in 1640. The Cathedral was built for the Dominicans and paid for by the Royal Treasury out of the proceeds of the sale of the Crown’s property. The Cathedral stands to the west of the great square called Terreiro de Sabaio and has its façade turned to the east. Its beautiful courtyard is approached by a flight of steps. The building is Portuguese-Gothic in style with a Tuscan exterior and Corinthian interior. The church is 250 ft in length and 181 ft in breath. The frontispiece stands 115 ft high. There were originally two towers, one on either side of the façade, but the one on the southern side collapsed in 1776. The exterior of the cathedral is notable for its plainness of style built in the Tuscan tradition. The loss of one bell tower, which was never rebuilt, has given the building a unique look. The Sé Cathedral has five bells. The existing tower houses a famous bell, one of the largest in Goa and often referred to as ‘Golden Bell’ on account of its rich tone which has been immortalized in a Portuguese poem. The main altar is dedicated to St. Catherine of Alexandria, and old paintings on either side of it depict scenes from her life and martyrdom. The Cathedral has been built on a raised plinth of laterite, covered over with lime plaster. There is a long nave, two aisles and a transept. A bell tower is located to the southern side of the façade. The nave is barrel-vaulted while the crossing is rib-vaulted. Massive pillars support the vault in the nave and the choir, while the chapels on either side are separated by internal defenses. The building is oblong on plan but has a cruciform layout in the interior. The main entrance in the façade has Corinthian columns on plinths supporting a pediment containing an inscription in Latin recording that, in 1562, in the reign of King Dom Sebastiao, this Cathedral was ordered to be erected, the Archbishops and the primates being administrators and that the succeeding kings continued the same at the cost of the Royal Treasury. There are four chapels on either side of the nave, two of which have perforated wooden screens across the entrance. The screens have a high degree of filigree carving which has transformed wood into most delicate insinuations of foliage. Of these two screened chapels, the outstanding Chapel of the Blessed Sacrament has a magnificently gilded and beautifully decorated wall and ceiling, in complete contrast to the sober look of the cathedral’s interior. On the right of the nave, is the other screened chapel, the Chapel of the Cross of Miracles. A vision of Christ is said to have appeared in 1919 on this huge, plain, cross. Towering above the main altar is the huge gilded reredos. Scenes from the life of St Catherine, to whom the cathedral is dedicated, are carved on its six main panels. The Saint was beheaded in Alexandria and among the images here are those showing her awaiting execution and being carried to Mount Sinai by angels. The two small statuettes inset into the main pillars supporting the choir are that of St Francis Xavier and St Ignatius Loyola. To the right is a chamber containing the baptismal font made in 1532, perhaps brought from the old Cathedral. St Francis Xavier is said to have baptized thousands of Goan converts using this font. A large painting of St. Christopher is hung beneath the choir. To the left of the entrance are four chapels dedicated to Our Lady of Virtues, St. Sebastian, the Blessed Sacrament and Our Lady of Life. To the right, again are four chapels dedicated to St. Anthony, St. Bernard, the Cross of Miracles and the Holy Ghost. In the nave are two wooden pulpits projecting from two columns on the right. In the transept are six altars, three on either side of the main altar. The altars on the right side are those of St. Anna, Our Lady of Doloures and St. Peter, while those on the left are those of Our Lady of Sorrows, Our Lady of Three Necessities and Our Lady of Hope. The arches accommodating four of these altars are decorated with paintings depicting scenes from the lives of the saints. On either side of the nave is a niche in which are kept the wooden statues of St. Paul and St. Peter. In the nave, near the altar, to the right is a projecting gallery on which is kept an 18th century organ. In the nave near the altar are seats for the canon and a throne for the archbishop. There is also a richly carved ebony stand, which was originally in the Church of St. Francis of Assisi. To the right is a door that leads to the sacristy, which is a barrel-vaulted structure with gilded altar showing a church modeled after St. Peter’s Church in Rome. The adjoining convent has been turned in to an Archeological Museum and is open to the public. Just behind the cathedral lies a two storied edifice, the Palace of the Archbishop, which is no longer in use. The Franciscan church lies to the west of the cathedral.